The 10 Best Mexican Restaurants in Wyoming! Historically, Wyoming’s been a thoroughfare of migrating Native peoples, and among those are a Mexican population that have brought their incredible, authentic recipes to Big Wyoming. Whether you’re craving crispy tortillas with pork and homemade guacamole or a hearty taco salad, you can get it all at these 10 awesome Mexican restaurants in Wyoming. Mi casa es su casa. This is essence of Mexican cuisine: “My house is your house.” This unassuming grub-hub is nestled in a town of less than 500. A humble authenticity-incarnate, Su Casa manifests the best that Mexican-American cuisine has to offer: unpretentious, delicious, and served with genuine hospitality. Tacos and burritos here are assured delicacies. But the tostadas, crisp tortillas topped with an assortment of braised, grilled and otherwise love-inspired ingredients (pork and guacamole! ), are especially excellent! The important facets are all there: simple, unassuming, humble, and derived from grandma’s recipes. For nearly 20 years, this taqueria-turned restaurant cranks-out delicious Mexican cuisine, especially in taco form. Formerly Sanchez Taqueria, this restaurant has expanded beyond its once never-changing wall-mounted menu. The dishes here remain simply prepared, with the ubiquitous (and necessary) cabbage and pico, beans and rice. But the greatest hits are bookended by truly authentic and foodie-arousing items, including tacos with beef tongue (lengua) and brain (cabeza). Don’t be surprised if a random celebrity covertly swings through. In the restaurant industry, there always exist the (sometimes) conflicting pulls of modernization and authenticity. Hatch certainly respects authenticity, tradition and fresh ingredients, but it certainly takes the more modern, more haute route. The drinks and tacos are cutting-edge, with the millennial appeal of non-GMO tortillas, organic produce and gluten-free & vegan options. Add to that the largest tequila & mescal section in the area, and this taqueria assures a classy and delicious tour through the ritzier areas of Mexico. The elk quesadillas or chicken glazed with peach and habanero are mouthwatering entrees. Rock Springs brims with the families and cuisines of its historical workforce: especially those from Mexico and Eastern Europe. And Fiesta brings a subtle twist to traditionally Mexican cuisine. The capital of the state of Jalisco, Guadalajara is the second-largest Mexican city. It’s food culture nuanced and complex, a culinary residue of the commingling of indigenous with Spanish and other European cultures. The Cancun platters and apps are great. Bringing a uniquely Texan flair to Mexican cuisine, this Tex-Mex makes use of beef, beans and other American-ethic novelties. And the longevity of the establishment, in a region awash in money, tourism and shifting demographics, is a testament to the tacos. The delicious, fresh chips and house-made salsa foretell a great meal to come. The classic al pastor tacos are primo: savory, slightly spicy pork is marinated and braised in a sweet-tangy chile-pineapple brine. The plates are filling and very well executed: the shrimp enchiladas and green-chile beef tamales are fantastic. Where will you be spending #cincodemayo ?!? Check our blog today for ideas like @merrypiglets for deals on fajitas and margs! Twenty years strong, the food at Corona is tasty and made from scratch, every day. This is a Though “handmade” is so ubiquitous in Mexico that it’s a given. But for many American food establishments, this quaint notion simply cuts into profit. Corona makes its ancestors proud with fresh made food, daily. While this restaurant hasn’t reinvented the wheel, even such gringo-friendly family joints still produce some tasty tacos. The sizzling fajitas are deliciously interactive, as are the chile colorado and chile verde, served with warm tortillas and fresh fixins’. The building itself is well over a century old. And as the name implies, it was indeed a train depot. This American-Industrial Age ingenuity and architecture still reverberates, adding a nostalgic patina to an already authentic restaurant. This train-car shaped establishment boasts an extensive menu of Mexican-American classics for picky foodies and (even pickier) children alike. The best tasting menu experience here: taco salad, tostada, smothered burrito, et al. Authentic and long-standing, El Tapatio has been a tortilla-and-meat, rice-and-bean mecca for the rural residents of the Powell area. Despite its being a figurative desert for seafood, the shrimp is very good at this restaurant. But the standouts are the tacos and burritos, comfortingly drenched in choices of salsas. Get some chips, a dip or two and lounge for the evening with the most satisfying Mexican in (really) rural Wyoming. 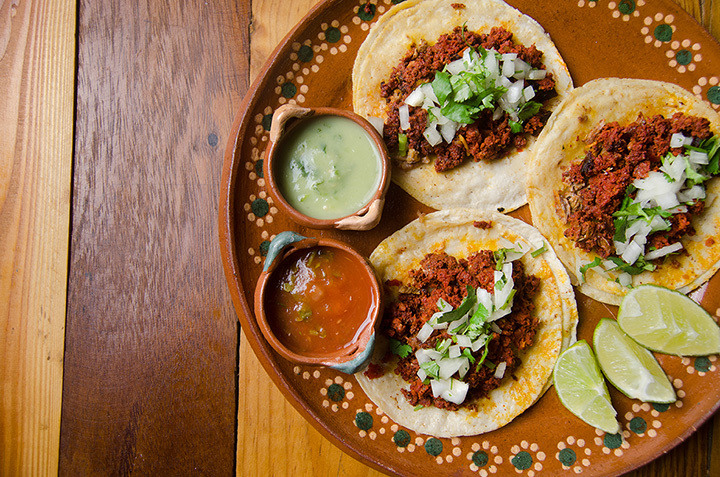 Owned by passionate torch-bearers of authentic Mexican cuisine, this family-friendly joint blends savory and local entrees for the adults with kid palate-friendly items like straightforward tacos and the like. The molcajete is filling and fun, and they’ve excellent tostadas topped with lime-laden ceviche, or smothered flautas with shredded beef. This family-owned, authentic restaurant slings some seriously approachable (and delectable!) Mexican fare. This casual, welcomingly-lit open-dining room caters to families, kids and larger groups. The menu is familiar and suited to any group’s tastes: burritos, tacos, chicken and steak, with kids’ items, including burgers, for even the pickiest palates. Seafood is common in Los Cabos, Mexico, so the mariscos here are stellar. Try any of the savory shrimp and prawn dishes, in soup (“7 Mares”) or entree form (mariscos con ago o arroz).